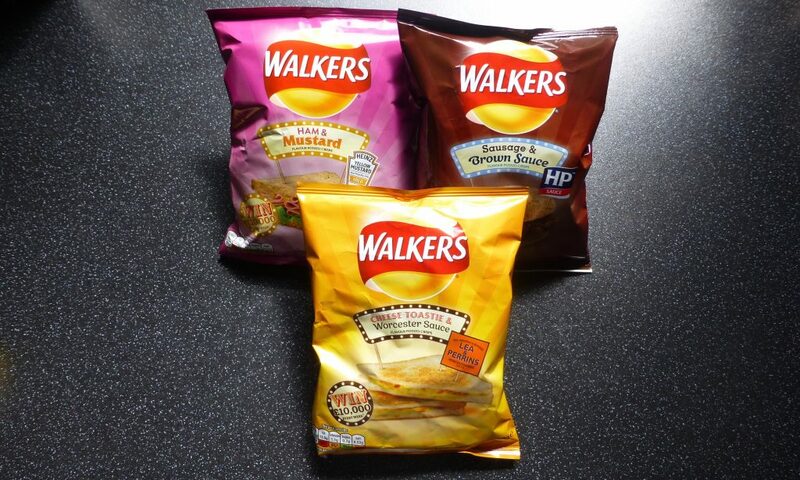 Finally I have found the new Walkers & Heinz Sandwich Crisps. The two have teamed up together and become a power couple to give us some of our favourite sarnie combinations in crisp form. There are 6 varieties on offer – Cheese Toastie & Worcester Sauce, Sausage & Brown Sauce, Bacon & Tomato Ketchup, Ham & Mustard, Roast Chicken & Mayonnaise and Cheese, Cucumber & Salad Cream. I’ll be honest the one I was most excited about was the Cheese Toastie, the others are neither here nor there and the Salad Cream, well that is just plain wrong. I got my mitts on 3 flavours in Boots for 65p each. These were bright yellow making me a little hesitant to munch these. I am not a mustard lover and practically sob if I buy a ham sarnie and find a hidden thick coating of mustard. Giving these a go I couldn’t really detect anything. There was a slight bacon taste, bit like a mild version of Walkers Smoky Bacon. In terms of mustard they really do mean mild, so mild I couldn’t taste it. Bit of a boring crisp if you ask me. Simply put… my god these are good. 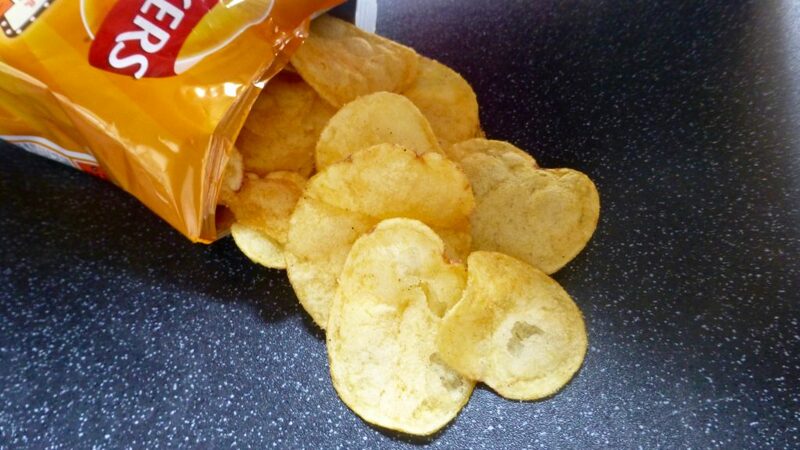 The crisps were pretty sizeable, nice and crunchy and full of flavour. These were exactly what it says on the packet. The meaty sausage flavour comes through with the perfectly balanced accompaniment of spicy Brown Sauce. 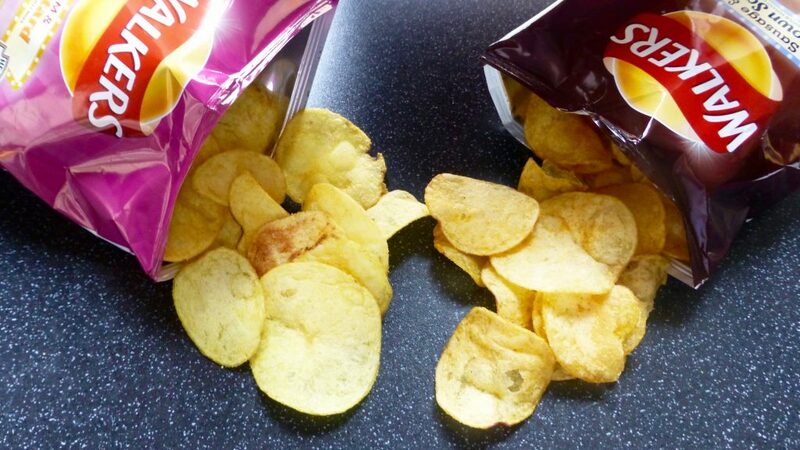 It’s a fine line with the brown stuff but Walkers and Heinz have mastered that balance. YUM! Cracking these open they smelt incredibly inviting. The cheese flavouring smelt faint with the sauce being the powerhouse. Again sizeable and crunchy I dug straight in. The sauce was a smack you in the chops flavour, it was fiery, a little salty but so delicious. The trouble is though it completely killed off the cheese, so much so there wasn’t a cheesey crisp in sight. My expectations were shattered! The idea of Walkers & Heinz Sandwich Crisps I love however the execution is a bit of a mixed bag. The Ham & Mustard we can rule out as naff. The Cheese Toastie which I was most looking forward to was a complete let down. Although they are nice they don’t have the cheese element and just taste of the standard Walkers Worcester Sauce Crisps. What I am most surprised about was the Sausage & Brown Sauce and how much I loved them. Like really loved. I hope the Sausey is here to stay, it gets my vote! If you’re wondering what the Chicken & Mayonnaise or Cheese, Cucumber & Salad Cream are like, head over to Kevvie’s Snack Reviews here. In the meantime give these a whirl yourself, you can either buy in single packs or most supermarkets are now doing variety packs. The mere mention of these makes my toes curl. I shall be one boring person and stick to my standard flavours. You’re one brave reviewer! !